For conference weekend, my parents came down. I told Mark that I had 2 projects that needed some work... 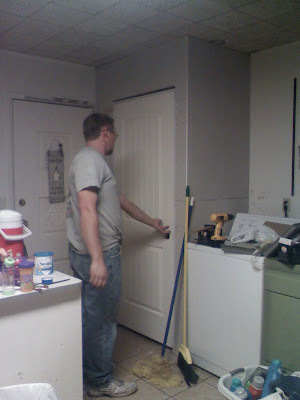 The bathroom and enclosing the water heater (Cami likes to pull the insulation out). I think Mark is tired of working on the bathroom... So he and my dad started working on the water heater. I must say, it makes the house look SOOOO much better!! I can't wait to replace all the doors, it will give the house a more cozy feeling. Thank you Mark and my dad for doing that for me!! It looks so nice! Mark is such a great guy and brother.